Maybe you’ve heard of these old adages? Birds of a feather flock together. You are the company you keep. 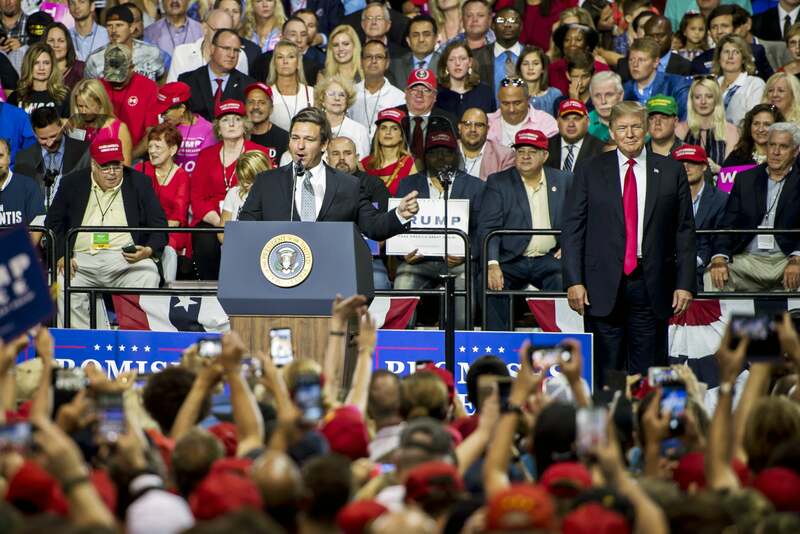 The list goes on, and Ron DeSantis, the GOP’s gubernatorial nominee out of Florida, keeps on finding himself in a bind after either he, his campaign or one of his supporters insists on putting their feet in the mouth. This time, according to Politico, DeSantis has triggered scrutiny after a Republican activist, who has donated more than $20,000 to his campaign and lined up a speech for him at Trump’s other White House, Mar-a-Lago, called President Barack Obama a “F— THE MUSLIM N—-” on Twitter. The activist in question, Steven Alembik, told Politico on Wednesday that the tweet was written in anger, but insisted he was not a racist. It’s always surprising how people don’t understand how being a racist works, but, I guess. Moreover, Alembik attempted to defend himself, saying that there was a double standard for white people using the N-word. “When I write anything inflammatory, it’s because I’m seriously pissed off. I’m an emotional human being. Do I have a filter on what I say? In public, yes. Would I use that word in public? No. This is Twitter,” he added. The cognitive dissonance is real. It’s also fascinating how white people like Alembik understand the alleged “double standard” when it comes to the n-word, but seem to get lost when we discuss the “double standard” in the criminal justice system and police brutality. This coming just after DeSantis stepped in it himself a day after the Aug. 28 primary, saying that Florida should not “monkey this up” by electing progressive nominee Andrew Gillum, a black man, as governor. “The last thing we need to do is to monkey this up by trying to embrace a socialist agenda with huge tax increases and bankrupting the state,” DeSantis said during an appearance on Fox News. You only need to imagine the backlash that turn of phrase wrought. DeSantis, for his part, denied that there was any racial slight behind his usage. However, counting in Alembik’s slip up, this is the fifth racially-tinged issue that has come up concerning him or his campaign. On Friday, The Miami Herald reported that DeSantis’ campaign blocked a former Miami state lawmaker who left office after using racial slurs and threatening a colleague from co-chairing a fundraiser for his gubernatorial campaign. “Ralph Arza’s name was removed because of hurtful and disgusting racial slurs that he has used in the past. He is not affiliated with our campaign,” the DeSantis campaign said in a written statement. On Sept. 9, the Washington Post, building upon a Miami New Times story from earlier in the campaign, reported DeSantis “spoke four times at conferences organized by a conservative activist who has said that African Americans owe their freedom to white people and that the country’s ‘only serious race war’ is against whites. DeSantis disavowed the comments about slavery but has refused to take other questions about the event held by the Freedom Center, for which Alembik’s company, SMA Communications, has done work. On Sept. 4, POLITICO reported that DeSantis called on an Orlando-area GOP official to resign her position Tuesday after she posted what he called a“disgusting” racially-charged Facebook meme falsely claiming that Gillum wants blacks to be “paid back” because of slavery. Scott also denounced the comments. On Aug. 30, the Miami New Times reported that DeSantis was “outed” as an administrator of a Tea Party Facebook group where commentators repeatedly make racist and racially charged posts. DeSantis said he was unaware he was an administrator and withdrew from the group. Meanwhile DeSantis is hoping everyone just ignores the company he keeps and focus on his platform. “We got to focus on the issues here, so please judge our campaign on our ideas, on our agenda, on what we are saying and I’m happy to defend that and I thank you guys for coming out. Thank you,” he told reporters.